I really wanted to like this book, but I just couldn’t. The characters were not believable. The main character, Mireille, is a Haitian American woman who visits her wealthy parents in Haiti along with her American husband and infant son. While there, she is kidnapped and held for ransom, but her father refuses to pay on principle. She is held for 13 days, and she suffers all of the horrible things you could imagine happening to a woman kidnapped by a group of ruthless men. The story itself is compelling and dramatic. There were times it made me cry, and I certainly wanted to see what happened, but Mireille is just not realistic. She’s too passionate and colorful before her kidnapping, too injured and crazed afterwards. There’s no subtlety to it. I didn’t underline a single passage, which is highly unusual for me, and I think speaks to the type of writing used in the book – simplistic, unbeautiful. The short sentences – rather than make the story feel fast paced and raw – seemed gimmicky. 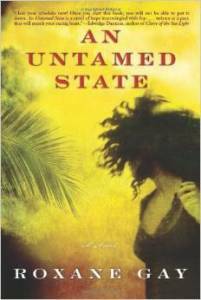 An Untamed State got a lot of attention when it was released, so I was really looking forward to it, and I almost went ahead and bought Roxane Gay’s Bad Feminist when I bought An Untamed State, but now I’m glad I didn’t. Having read a lot of war fiction and nonfiction lately, and with several “heavy” books coming up on my To Be Read list, I decided to opt for a shorter, lighter read in the meantime. Judging The Enchanted solely by its title and cover (something I rarely do and will be wary of in the future), I assumed it was a magical fiction story and started reading. I could not have been more wrong. This is no light read. The horrors inked into these pages made my chest ache at times, and yet I could not put this book down. The Enchanted is narrated by a mute psychopath on death row. He’s created an enchanted fantasy world (hark, the title) to overlay the brutal realities of life in prison – a place filled with both innocents and monsters. Frighteningly, the inmates and the guards alike fall into both categories. Beautifully written, The Enchanted also follows a woman’s quest to get one inmate off of death row. Simply referred to throughout the novel as “The Lady,” her storyline is one of the most absorbing. I hate to give so-called ‘trigger warnings’ about a book because they are overused today and because I don’t like to make assumptions about what other people will find disturbing, but I feel compelled in this instance to assign a trigger warning for anyone who has experienced childhood sexual abuse. This book may be difficult for you. That said, to the rest of you, steel yourselves for the terrors of prison life, and read this book…if only so I have someone with whom to discuss it! I am simply in awe of Rene Denfeld after reading this novel. How anyone can tell such a bone-chilling story so beautifully is beyond me. 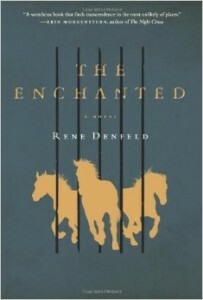 Click here to purchase The Enchanted: A Novel by Rene Denfeld in hardcover and here for the Kindle ebook. As always, feel free to let me know what you think about the book in the Comments.